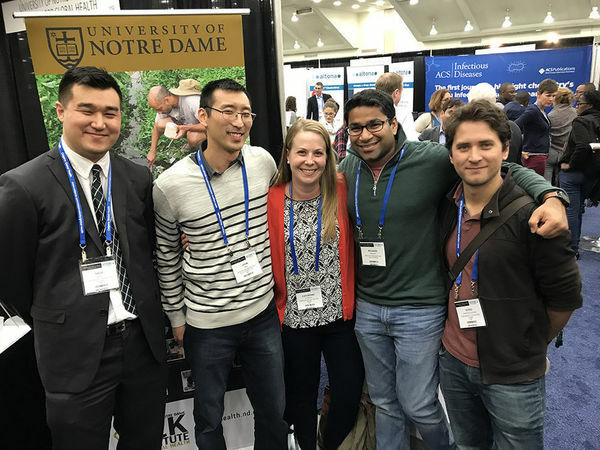 From Saturday, October 28 through Thursday, November 1, members of the University of Notre Dame research community will travel to New Orleans, LA for the annual American Society of Tropical Medicine and Hygiene (ASTMH) meeting. Of the over 40 Notre Dame faculty, researchers, and students in attendance, many will be presenting their research through lectures, presentations, and posters. The EIGH will host their annual reception titled, “Rally with Notre Dame for global health” on Monday, October 29. Visit their booth #313 in the Exhibit Hall on Sunday or Monday for details. More than 20 poster presentations by faculty and students from the EIGH will participate in the meeting. Additionally, VectorBase, the National Institute of Allergy Infectious Diseases Bioinformatics Resource Center, which is dedicated to providing data for the scientific community for Invertebrate Vectors of Human Pathogens and is housed at Notre Dame, will be represented at the conference. VectorBase provides an e-forum for the discussion and distribution of news and information as well as tools to facilitate the querying and analysis of arthropod genome data sets present at the site. The ASTMH was founded in 1903 and is the largest international scientific organization of experts dedicated to reducing the worldwide burden of tropical infectious diseases and improving global health. It has over 4,000 members and is located in 113 countries. Both Ferdig and Molly Duman-Scheel, adjunct assistant professor of biological sciences at Notre Dame, currently serve in ASTMH leadership positions as the President-Elect for the American Committee of Molecular, Cellular, and Immunoparasitology and on the American Committee of Medical Entomology Council, respectively. To learn more about this event and how EIGH affiliated faculty are participating, please visit https://www.astmh.org/. Originally published by Brandi Klingerman at research.nd.edu on October 29, 2018.